Dietitians offer strategies clients can use to enjoy their favorite sweets of the season. From Thanksgiving's postdinner pumpkin and apple pie to the Christmas cookies that make their way to office cubicles long before and after December 25, the holiday season is full of food obstacles that dare to demolish the healthful eating efforts of clients and patients and especially those with diabetes. "The holidays can be challenging for all of us in regard to making healthful food choices and not overindulging," says Alison Massey, MS, RD, LDN, CDE, the director of diabetes education for The Endocrinology Center at Mercy Medical Center in Baltimore. "Not only are there many high-carbohydrate tempting treats, but individuals also tend to perhaps partake in enjoying alcoholic as well as other higher carbohydrate specialty beverages more frequently." Surely, no one wants to start the new year with a few extra pounds around their waist. But for people with diabetes, the stakes of indulging in too many holiday sweets are higher than that which can be seen on the scale. "The holiday season tends to last from Halloween through New Year's, which is almost nine weeks of celebrations," says Toby Smithson, MS, RDN, LDN, CDE, author of Diabetes Meal Planning and Nutrition for Dummies, founder of DiabetesEveryDay.com, and a spokesperson for the Academy of Nutrition and Dietetics. "If desserts aren't calculated correctly into a meal plan and blood glucose levels remain consistently elevated, this can raise the results of the hemoglobin A1c level, and higher levels are associated with increased risk of diabetes complications." "The biggest issue [for people with diabetes] is simply the availability of tempting, calorie-dense foods and the peer pressure to eat them during the holidays," says Sheri Colberg, PhD, a professor of exercise science at Old Dominion University, in Norfolk, Virginia, and a well-known diabetes researcher. "It's simply too easy to mindlessly eat a holiday cookie or some chocolate when it's sitting out for everyone to enjoy in an office or work setting. They may not be particularly filling, but they do contain an abundance of excess calories and will likely contribute to elevations in blood glucose levels and weight gain." Desserts and other sweet temptations aren't a potential challenge for the holidays; they're a given. And according to Jill Weisenberger, MS, RDN, CDE, FAND, a dietitian in private practice, national media spokesperson, and author of Diabetes Weight Loss—Week by Week and The Overworked Person's Guide to Better Nutrition, asking clients to rely on willpower to get them through such enticements is ineffective and just plain silly. "No one has enough willpower all of the time," she says. "I want my patients to rely on skills and strategies," she adds, noting that educating patients on smart substitutions, such as skipping a dinner roll for a Christmas cookie, making a pumpkin pie that's diabetes-friendly, and mindful eating can help. According to Smithson, just as there's no one meal plan that will work for all patients with diabetes, there's also no one-size-fits-all solution for successfully integrating desserts into a diabetes patient's diet during the holidays. Kimberly Gomer, MS, RD, LDN, director of nutrition at Pritikin Longevity Center and Spa, agrees. "In terms of desserts and sweets, individualizing an eating plan is definitely key," she says. "If we had a group of 10 people with diabetes and fed them the exact same dessert or sweet and then tested their blood sugar, we may have 10 different readings. It's definitely an individual process as to what foods will elevate blood sugar in certain individuals." Such individualized tips and meal plans also should take into account the type of diabetes a patient has, says Amy Kimberlain, RD, LD/N, RYT, from the Diabetes Research Institute. While she counsels all diabetes patients about healthful eating, and notes that everyone, even those without diabetes, can benefit from tips on how to eat more healthfully during the holidays, Kimberlain says she tackles the issue of desserts differently for the two patient groups. In general, Kimberlain says she tells patients with type 1 diabetes that all foods can fit into their meal plan and there are no restrictions when it comes to desserts. "Their insulin-to-carb ratio is what I utilize to allow patients to have a better understanding when teaching them how to cover for the food that they are eating, whether that be a dessert or a piece of fruit," she says. "It's a constant monitoring of their blood glucose levels to see how a food affects them. There are no good or bad numbers. It's trying to make sense of their numbers and how we can try to best control them with their insulin." Conversely, with patients who have type 2 diabetes, Kimberlain calculates their total caloric needs, and then demonstrates how she allots a certain percentage for their carbohydrates, protein, and fat intake. "From there, we individualize a meal pattern to allow for their daily needs to be divided out throughout the day. I try to teach patients that it's important to keep their blood sugar levels within a desirable range to help prevent complications." 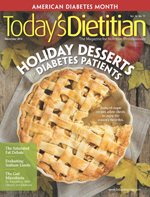 To help diabetes clients enjoy the holidays' sweetness without any unnecessary A1c spikes, Today's Dietitian asked several diabetes and nutrition experts to offer their best tips on how clients and patients can navigate the holiday season—and they've provided their favorite recipes, too. Rule No. 1 for diabetes patients, particularly for those with type 2 diabetes: Dessert with dinner (and most sweets, in fact) is allowed—but it's all about moderation, says Massey, who notes that this recommendation has changed in the past couple decades. "The issue of desserts has changed over the years as nutrition-science has continued to evolve," she says. "Initially, individuals with diabetes were discouraged from eating sweets and desserts entirely with the thought that those foods would elevate blood glucose more than other 'starchy' foods like pastas." The concept that people with diabetes "can't have anything with sugar" is no longer valid, says Smithson, who notes that health care professionals now look at the total carbohydrate content of foods instead. "This offers more options for fitting in foods such as dessert for a person with diabetes," she says. With the prevalence of newer insulins that can be adjusted to a person's individual blood glucose (or ingested carb intake), Weisenberger says people with diabetes can have more flexibility with their diet. "I try to individualize everything from the number of meals and snacks to the amount of carbohydrates to even the amount of junky or splurge foods each week," says Weisenberger of how she addresses the issue of desserts with clients. "I never want my patients to think to themselves, 'I can't have.' I teach them that their food choices are exactly that—their food choices—no right or wrong. They may choose to have or not to have, but it's a choice, not a mandate. "But by reading food labels, learning about their disease, and by measuring their blood glucose levels often, they can make informed choices," she continues. It's this mindset that she hopes will help clients determine how to evaluate desserts during the holidays—or any time of the year. All this adds up to an environment where people with diabetes "can have their cake and eat it, too," Smithson says, but balance, in the way of moderation, is the key. Whether through miniature pumpkin pies or smart recipe substitutions, dietitians can share these tips and strategies so clients can enjoy a holiday season with just the right amount of sweetness. Another way people with diabetes can enjoy some holiday treats without negative consequences is to plan ahead and eat less carb-heavy foods when they know they're going to have a sweet snack later in the day. Cassandra Verdi, MPH, RD, associate director of nutrition and medical affairs for the American Diabetes Association says, "It's important to swap in sweets for other carbohydrate foods rather than just adding them to your meal plan in order to keep the amount of carbohydrate about the same at that meal or snack," she says. For example, if a client craves a piece of pumpkin pie, you might suggest they pass on the dinner roll and/or potatoes at mealtime. Or if a client desires some Christmas cookies, they should give up a carbohydrate elsewhere in the meal, Weisenberger says. "However, you don't want patients doing this so frequently that they miss out on important nutrients from healthier carbohydrate sources, which is why saving sweets for special occasions is an important message," Verdi says. By having clients measure their blood glucose just before and about two hours after eating, they can learn how food, combinations of food, and quantities of food affect their individual blood glucose levels, Weisenberger says. "They can use this information to determine for themselves how much dessert to eat," she says. One tip that Weisenberger says has helped her clients is to use their calendar to give them a visual marker of the sweets that will come across their path. "I tell patients to look ahead at all of the possible opportunities [they'll have] to eat at parties," she says. "Even look at cookie swaps and baking days. Circle them on a calendar to see just how many opportunities are coming up, then decide in advance which of those events is really worth the indulgence. "Chances are that if the person thinks it through and makes a mindful decision, it's not so hard to pass by the tray of mediocre sweets," she adds. Making mindful decisions to avoid overindulging, according to Colberg, is a great strategy for diabetes clients. "Pay attention to what you're eating," she says. "And during the holidays, avoid eating when you're not truly hungry." Another way clients can practice mindfulness is to focus on enjoying their favorite foods instead of sampling every cake, cookie, and pie offered, Massey says. Or suggest clients not leave goodies sitting out or where they spend most of their time at home, Colberg adds. "If you have to get up and walk to get a treat, you will have the time to think twice about doing it," she says. "To help with mindful eating, place prepared desserts out of reach and out of sight," Smithson suggests. "This will help you make a conscious effort when scooping up a dessert." This includes not bringing home high-carb leftovers from a holiday party, which will tempt clients when they least expect it, Verdi says. To best navigate the office environment with its unexpected goodies, Colberg suggests clients avoid trouble areas whenever possible. "Stay away from areas in the workplace where people bring holiday treats and leave them sitting out for everyone to share," she says. "If you do have to pass them, make a decision to only partake in them once, at a certain time of day, and stick with that." Weisenberger agrees. "Avoid the office 'dump,'" she says—that place where coworkers bring food so they aren't tempted at home. "Ask that desserts be kept in only one place at work. Challenge your colleagues to [have] a healthful work environment." And for those times they're in a pinch, encourage clients to keep healthful snacks at their desk, Verdi says. According to Kimberlain, regular exercise also can help combat excess carb intake. "While it's easy to take in an excess amount of calories from food during the holidays, it's also a time, whether it's due to the weather or due to many social functions, that people tend to exercise less," she says. Maintaining a regular exercise program is important, and clients will feel better when they fit it in, she says. Kimberlain tells clients to make sure they get in a good workout on the day of a holiday party or event, even if it's just 10- or 15-minute brisk walks at intervals throughout the day. "They all add up," she says. Kimberlain also recommends clients choose fruit first when looking for a comforting holiday dessert. Not only is fruit lower in sugar, she says eating it for dessert can help clients reach the recommended two to four servings per day. "Better dessert choices for anyone with or without diabetes will include some fruit, low-fat dairy, or even whole grains," says Verdi, adding that fruit cobbler with an oatmeal and walnut crumble or a fruit pie topped with nuts are a couple of her favorites. "Other ideas are fruit dipped in dark chocolate and sprinkled with chopped nuts or low-fat pudding with berries," she says. "However, it's important to remember that while these may have more nutritional value than triple layer chocolate cake, you should still keep portions small, and you need to count them in your meal plan." Weisenberger also recommends fruit-based desserts to diabetes clients and enjoys them herself. "I adore chocolate-covered strawberries and apricots," she says. Clients can make another diabetes-friendly fruit dessert at home with the Yonanas machine, a small kitchen appliance that turns frozen fruits, and even veggies, into a dessert that tastes just like soft-serve ice cream (no carbohydrate-rich milk, sugar, or cream necessary). What's Colberg's favorite fruit dessert? It's simple yet satisfying: "Fresh strawberries, blueberries, and other berries in a bowl with a dollop of whipped cream (or Cool Whip) on top," she says. When it comes to portion sizes, Massey says smaller portions of anything—whether it's brownies, tarts, or cheesecake—can help diabetes patients balance carbohydrate intake. • 1/2 cup ice cream. • one standard-size piece of pumpkin or custard pie (22 g carb). "These dessert items can serve as a guide in estimating carb content of other desserts," Smithson says. Verdi says clients can find a summary of serving sizes and carbohydrate gram estimations from Choose Your Foods — Food Lists for Diabetes, a publication by the American Diabetes Association and the Academy of Nutrition and Dietetics. Overall, any dessert that clients take only one bite or two of is more diabetes friendly, says Colberg, who tells patients to savor one to two bites slowly to experience the taste of any dessert, then skip the rest. For more diabetes-friendly desserts and other dish ideas, Verdi recommends the American Diabetes Association's Recipes for Healthy Living website (www.diabetes.org/recipes) as a great resource for free recipes and meal planning tips for people with diabetes. Because there's no holiday vacation from diabetes itself, Smithson says the best strategy for clients to enjoy some of the season's sugar without negatively affecting their A1c is to stay focused on their meal plan and mindfully incorporate desserts. Weisenberger agrees. "Choose the dessert that will make you the happiest," she tells clients. "Serve yourself an appropriate amount, eat it slowly, and then savor every bite." According to a recent survey by Krusteaz, a maker of various pancake, waffle, and baking mixes, 91% of Americans enjoy eating breakfast foods for dinner. Whether for its convenience factor, ease of preparation, or for the sake of family tradition, it's of little surprise that warm pancakes can make for an inviting meal on a cold winter's night. Yet slather on a slab of butter (or two) and more than a bit of syrup, and the carb count can skyrocket. But what about rethinking how people eat breakfast and serving it instead as a diabetes-friendly dessert? Try fresh cranberry fruit tarts or parfaits made with a slightly sweetened pumpkin filling, and suddenly you've got a fresh take on holiday dessert fare. Or, as in the recipe below, add some pecans and cranberry sauce to your favorite pancake mix, and you've got a flavor fit for any holiday get-together. After cooking, cut pancakes out with cookie cutters, and add a dollop of whipped cream with some fresh fruit instead of syrup. You'll have breakfast for dessert, which is sure to please any holiday party guests. 2. Pour slightly less than 1/4 cup batter per pancake onto lightly greased griddle. 3. Cook 11/4 to 11/2 minutes on each side, turning only once. "My family particularly enjoys pumpkin pie, which we make with modifications to the recipe to make it more diabetes friendly," says Sheri Colberg, PhD, a professor of exercise science at Old Dominion University in Norfolk, Virginia, and well-known diabetes researcher, who also happens to have type 1 diabetes. "For example, we use an artificial sweetener in place of sugar in the pie itself, along with egg beaters in place of eggs (to lower calories) and fat-free evaporated milk (again to lower calories). In the crust, we use 1/2 cup of milled flaxseed in place of 1/2 cup flour when making the crust and use a reduced-calorie margarine in place of shortening in the crust." 1. Make homemade pie shells first. For crust, put flour, flaxseed, salt, and margarine into a food processor and blend for 30 seconds, or use pastry blender to combine if preferred. Add water by the tablespoon until dough balls up on its own in the processor. 2. Remove dough and separate into two equal pieces. Roll out dough on lightly floured surface using extra flour sprinkled on top to prevent it from sticking to the rolling pin. Dough should be rolled out to size larger than 9-inch pie plate. Fold in half twice and transfer to pie plate before unfolding. Crimp edges before adding pumpkin pie filling. *Note: You can substitute 31/2 tsp pumpkin pie spice in place of cinnamon, ginger, and cloves. 1. Preheat oven to 425° F. Mix sugar substitute, salt, spices, and egg substitute in large mixing bowl, and stir in pumpkin. Then gradually stir in evaporated milk. Pour into pie shells. 2. Bake at 425° F for 15 minutes before reducing baking temperature to 350° F for another 40 to 50 minutes (or until toothpick or knife inserted near center comes out clean). 3. Cool on wire rack or stovetop for 2 hours. Cut and serve small slices of pie (1/8 or less) with dollop of sugar-free whipped topping or refrigerate pies for later use. 1. Combine apples, white sugar, water, lemon juice, ground cinnamon, and ground cloves in a saucepan. Bring to a boil; simmer until apples are very tender. Set aside. 2. Combine flour, almond meal, oats, brown sugar, and baking soda. 3. Cut in butter until mixture resembles coarse crumbs. Reserve 1/2 cup of the flour mixture. 4. Press remaining flour mixture into the bottom of an ungreased 9 X 9 X 2 inch baking pan. Spread with apple mixture. Sprinkle with reserved flour mixture. 5. Bake 20 to 35 minutes at 350° F. Cut into squares when cool. "My favorite diabetes-friendly desserts are always cheesecakes, in which I use part-skim ricotta cheese or cream cheese, eggs or egg substitute, sugar substitute, vanilla, and cinnamon to make a delicious dessert for the whole family to enjoy," says Felice Kosakavich, MS, RD, CDN, chief clinical dietitian at Workmen's Circle Multicare Center in New York. "I like to bake them in individual portion sizes using cupcake tins." 1. Preheat oven to 350° F. Beat ricotta, eggs, sugar substitute, flour, and almond extract in a large bowl. Use hand mixer or stir until well blended. Pour into 12 standard cupcake tins. 2. Bake 30 minutes or until knife inserted in center comes out clean. Tops should just be starting to brown. Cool on wire rack 30 minutes or longer and serve or refrigerate. Serve with whipped cream and berries, if desired.